Its Atom again! Are you looking for a board that provides the amazing service with its body? That’s what the Atom Drop Trough Longboard is all about. The board has already achieved popularity in the town. Making your boarding amazing, it will definitely value your money. With its great design in the body you will feel fantastic and comfortable to play with. It will give you the stability and speed you require in a Longboard. In this board, you will get the balance and stability you need. You may use the Longboard for multipurpose such as downhill riding, surfing, free riding, cruising, and much more. You can get it in different colors. Dimensions: 4 inches high x 10.6 inches wide x 41.7 inches long. The deck is constructed of full maple laminate and boasts a fantastic design. Extra Stability in downhill boarding. Reverse King Pin (RKP) trucks (245mm axles). Full maple laminate deck: Most of the users consider deck as one of the main feature of a board and this is what Drop Though comes with! With its full maple laminated deck you will find the board flexible, stronger and durable. Unique perimeter shape: Another feature of the Longboard that will attract you is its unique perimeter shape. Its 10.6 inch leverage helps to get rid of wheel bite. With this riding board you can do stunning job in maintaining a rider’s stability; you can expect that you will not fall off easily. Urethane wheels: The urethane wheels comes with numerous benefits. It will help you in easy and fast riding on all types of surfaces; even on different soft surfaces like metal, wood, marble and half pipes. You can use the board anywhere you would like without any problem. Tight bushings: There are some users who do not like the fact that the bushings are too tight. They can however be loosened to make sure you enjoy using the product the way you like it. 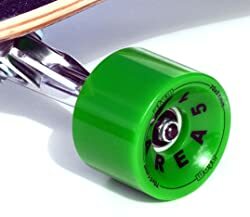 Bearings: Get some smooth and comfort boarding with the ABEC 9 bearing; you would like to enjoy some incredible cruise distances. Stability: In these types of boards, hardware is attached on the top of the deck, rather than the bottom. This will make you feel that you are close to the ground. 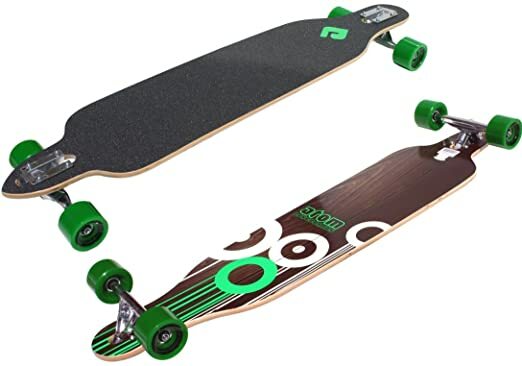 This Longboard can easily be used for cruising, leisurely strolls around town or a super quick way of transportation around campus. Maneuverability: Atom Drop Through Longboard comes with an important feature and that is the Reverse Kingpin trucks with 245 mm axles. These are super handy when cruising and bombing in hills. This is because of its great manoeuvrability and stability. Affordable: This tool is really affordable and easy to drive. Manufacturer’s Warranty: If you get any problem in it, you don’t need to worry. 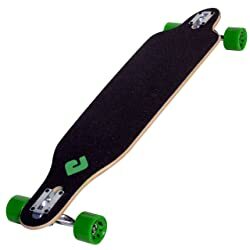 Just send it to the manufacturer for repairs or even replacement as Atom Drop Through Longboard has 1 year manufacturer’s guarantee. The design eliminates all possibility of wheel bite. It includes the decent Abec 9 bearings. Looks pretty cool (I get a lot of compliments for it). Symmetrical, unlike pintails, it really doesn't matter which side is forward. Use grease on the trucks to avoid squeaking sounds if it makes when turning. With its traditional design it may not seem outstanding to you. But the performance of the board will definitely carry up the whole things. The Atom Drop Through Longboard is a product that can satisfy both beginners as well as professionals. It comes with an amazing design that you will love and can be used by anyone for a very long time without any complications.